— Space shuttle Enterprise suffered minor wing damage on Sunday (June 3) when it collided with the navigation guides for a New York railroad bridge during the first half of its sea trek to a Manhattan museum for display. Mounted atop an open-air, flat-bed barge, Enterprise was on its way from John F. Kennedy (JFK) International Airport in New York to Weeks Marine in Jersey City, NJ when the accident occurred. 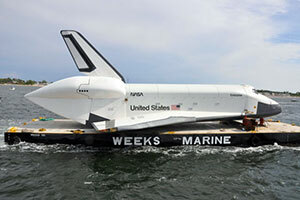 The shuttle, NASA's prototype for its orbiter fleet, was making the first leg of its trip to the Intrepid Sea, Air and Space Museum, a converted World War II aircraft carrier that is docked on Manhattan's west side. 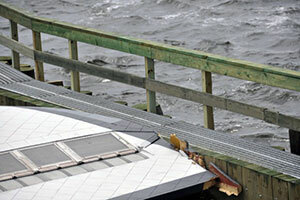 It wasn't weather but a different type of hurdle that slowed the shuttle's arrival in the Garden State on Sunday. The shuttle needed to pass under several waterway crossings to reach Jersey City, including the South Channel Subway Bridge, as well as the Cross Bay Veterans Memorial, Gil Hodges Memorial, and Verrazano- Narrows bridges. "The railroad bridge and the Cross Bay Bridge, each presented challenges," said Dennis Jenkins, who was aboard the barge with Enterprise. "The passage through the railroad bridge was narrow with only a few feet of clearance on each wingtip, while the Cross Bay was only a few feet higher than the vertical stabilizer," he wrote in an e-mail that was shared with collectSPACE. 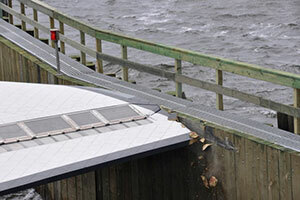 Jenkins' photos of the damage, which were also shared with collectSPACE, show Enterprise as it neared the bridge's navigation aid wooden bumpers. 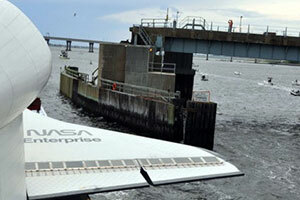 The shuttle's right wing scraped along the bridge barrier, which caused foam chunks to break away from the leading edge of Enterprise's elevon, or flap.